We’d love your help. 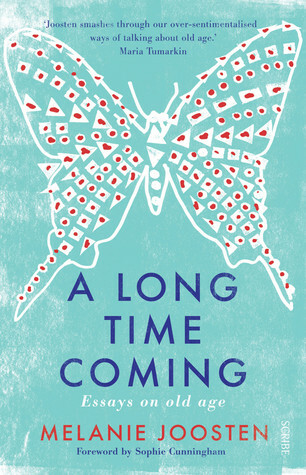 Let us know what’s wrong with this preview of A Long Time Coming by Melanie Joosten. With improved health care and higher standards of living, each generation is living longer than the last. Governments see our ageing population as an imminent disaster, and old age as a medical problem. We are encouraged to remain active, stay healthy, and work longer -- in short, to refuse becoming old. But if living longer is really about staying young, do we risk turning a blind eye to issues facing the elderly? To ask other readers questions about A Long Time Coming, please sign up. Joosten smashes through our over-sentimentalised ways of talking about old age. Thoughtful and honest, this book is a reminder to cherish our elders. [A] fine collection … shows deep commitment and quite profound levels of insight and compassion. Heartening … [Joosten has] a novelist's feel for the texture of life. [V]ivid and surprising ... This eloquent collection advocates for the e Joosten smashes through our over-sentimentalised ways of talking about old age. [V]ivid and surprising ... This eloquent collection advocates for the elderly. A powerful collection of essays exploring what it means to grow old. Well written, brimming with empathy ... a thoughtful work by a writer whose social work commitment arose from “a feeling of obligation towards those who do not have the opportunities I have had” ... This book pulls no punches, making it another valuable contribution to the debate we need to have. Joosten makes a plea for heightened empathy towards older people, but she goes on to make it clear that empathy without action — without changed perceptions, changed behaviour — is insufficient. As such, A Long Time Coming is a challenging as well as eminently readable book. [E]motionally wrenching, undeniably powerful piece ... A Long Time Coming is a work that deserves high praise for the persuasive way in which Joosten crafts her arguments toward greater understanding and compassion for older Australians. It’s an exceptional piece of writing, one that will provoke discussion, challenge opinions and, hopefully, inspire change. A series of essays on aging in Australia this book is in part memoir, in part the individual stories of aging Australians as told to the author and in part analysis of the issues faced as Australia cares for an increasing number of aged. It is a moving and powerful cry for better housing and care for the aged in a society where youth is idolised and the old have become invisible. I found this very disappointing. it seemed to be more about the author than her interviewees. I expected more of their views rather than lots of facts & figures. I really wanted to like this book of essays. The topic is important and the book is clearly well researched, but the result is patchy with a mix of interesting, thought-provoking essays and others that just seem pedestrian and don't really draw out the potential of the subject matter. Melanie Joosten is a writer who lives in Melbourne. Her first novel, Berlin Syndrome (2011) saw her named as a Sydney Morning Herald Best Young Novelist and awarded the Kathleen Mitchell Award for Young Writers. Berlin Syndrome is currently being turned into a film with a screenplay by Shaun Grant, to be directed by Cate Shortland. Melanie holds a Bachelor of Creative Arts (Honours), a Master of Ar Melanie Joosten is a writer who lives in Melbourne. Her first novel, Berlin Syndrome (2011) saw her named as a Sydney Morning Herald Best Young Novelist and awarded the Kathleen Mitchell Award for Young Writers. Berlin Syndrome is currently being turned into a film with a screenplay by Shaun Grant, to be directed by Cate Shortland.